Sample shown using classic monogram style and EBLS typestyle. 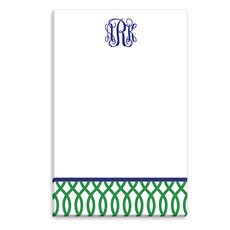 This set of folded note cards are perfect for saying thank you or writing a personal message to a friend.. Size of note card is 5.5" x 4.25". Your choice of personalization style and typestyle to be used. Blank white envelopes included. Printed return address in flat navy ink available. Positioning only as shown. College colors for a high school grad!